We are excited to announce that Amazon Business is now available at Amazon France (www.amazon.fr/business). We are now live in six countries, including Amazon Business in the United States, Germany, United Kingdom, Japan and India. Companies with operations in any of these countries can now purchase business supplies in their local language, receive local delivery, and more. Free premium shipping: Access free premium shipping for orders over €25 on millions of eligible items. VAT-exclusive pricing and VAT invoicing: Similar to Amazon Business UK and Amazon Business Germany, view pricing with and without VAT on millions of eligible products. Multi-user business accounts: Connect individuals or departments under one business account and gain visibility into how your business is spending on Amazon. Reporting and analytics: Gain insights into what, when and how your business is purchasing by creating custom reports on business spends. Purchasing system integration: Capability to integrate leading third-party procurement solutions for easy access to Amazon Business. Sellers on Amazon Business also have an opportunity to grow their businesses by reaching new customers in France, from small companies to multi-national organizations. Sellers on Amazon Business in France can access features such as the VAT Calculation Service, which automatically creates VAT invoices on behalf of sellers for Amazon orders placed and displays VAT-exclusive prices on their products to business customers. Amazon Business launched in the United States in April of 2015, and now serves more than one million business customers. Amazon Business launched in Germany in December of 2016, in the United Kingdom in April of 2017, and in Japan and India in September of 2017. 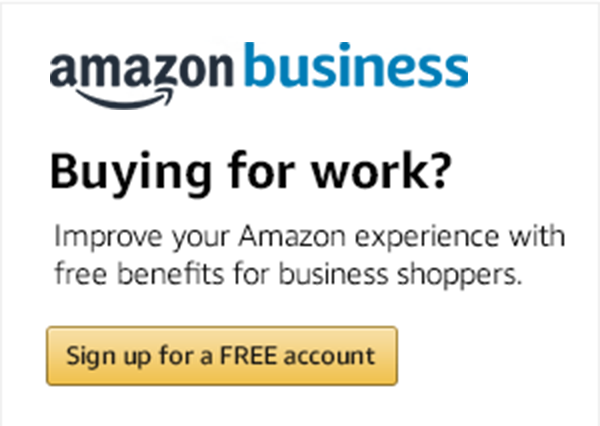 Create a free account today and explore all the benefits of Amazon Business on www.amazon.com/business.